Do you have a “bug-out bag” ready? If you’ve followed news about the California wildfires, you know that many people are forced to flee their homes unexpectedly at a moment’s notice. A little bit of planning goes a long way when it comes to disaster preparedness. One of the best ways to get ready for the worst is by putting together a “bug-out bag” – a collection of important documents and valuables, all in one place, ready to be scooped up and transported at a moment’s notice. A quick online search will show a plethora of survival kits available for purchase, and while those are useful (and you already have a small emergency kit in your vehicle for the winter, right? ), they’re not exactly what we’re looking for here. For most of us, wilderness survival isn’t our goal when putting together a bug-out bag – when the wildfire comes or the hurricane hits or the earthquake shakes, we want to have handy the documents and means to begin the long and complicated process of rebuilding our lives. So think of your bug-out bag as a starting point. It’s going to have in it the stuff you need to get started again. And a lot of that stuff is paper records. One of the best ways to ensure that your valuable records aren’t lost is redundancy. And one of the best ways of storing those redundant records is electronically. Keep copies on your phone, on your tablet, on your PC, and in the cloud. Take care to encrypt and password-protect those files. Then you’ll have them at your fingertips when you need them the most. Do the same with irreplaceable family photographs and videos. Inventory your belongings by photo or video. If it can be digitized, digitize it! And then make sure it’s securely stored in more than one place. What Records Are We Talking About? The vital ones! Birth certificates, marriage certificates, deeds and titles, passports and visas, papers of incorporation, leases, contracts, you name it! Some of the most important documents to store in your bug-out bag (virtual or not) are insurance records. Make sure those documents have with them your policy numbers, your insurance agent’s contact information, and instructions on how to file a claim. Since you’re already going through all that insurance paperwork, now’s a great time to review your policies and make sure you have adequate coverage. Have you built additions to the house not covered by the original policy? What’s your policy’s loss-of-use coverage? Has your property value increased? What’s the cost to replace your property? Maybe a quick chat with your insurance agent is in order! It can’t hurt to check in with her annually, anyway. Go see her. She’ll probably give you one of those little magnetic tear-off fridge calendars; those are cool. Whether you rent or own, staying up-to-date with your personal and business insurance is the best way to limit the damage a catastrophe can cause. Now that your documents are digitized and distributed, your vital papers safely stashed, and your emergency supplies consolidated, relax! Enjoy the feeling of being prepared. Add items and remove them from your bug-out bag as you see fit and as your circumstances demand. It’s much easier to maintain a secure document cache than it is to create one. Once you’ve put a process in place, you’ll find it easy to maintain. And now that you’ve got all your unique documents duplicated and secured, go to FEMA for a comprehensive checklist of other items to keep close in case of emergency. Disasters can happen anywhere – just ask the folks in Springfield who experienced the full wrath of last summer’s tornado or the Vermont communities who were flooded last year in the aftermath of a hurricane that was supposed to pass the state by. While we sometimes have warning about pending problems, catastrophic weather and disastrous natural events often take us by surprise. Today, the Insurance Institute for Business & Home Safety (IBHS) has introduced a new mobile disaster preparedness app – Know Your Plan – which features property protection guidance. It includes a variety of “resources and checklists that consumers can use to to help minimize property damage due to severe weather events and other disasters. Users also can build customized checklists, and can share their checklists with family and friends via email.” Users can also access local emergency information through a built-in Google Crisis Response feed. The iPhone app was developed with the Insurance Information Institute, and can be accessed at the iPhone store under Know Your Plan, or by searching “Insurance Information Institute” in the App store from any iPhone. Your disaster prep should also include a home inventory. We recommend two tools for that. See Know Your Stuff from the Insurance Information Institute or myHOME Scr.APP.book from the National Association of Insurance Commissioners. Spring floods: a nasty forecast. Is your home or business prepared? The Insurance Information Institute reports that there is a strong potential for a nasty flood season. While the areas at highest risk are in the Upper Midwest, The national Weather Service says that parts of southern New England, New York and Pennsylvania are also at risk. And NWS reminds us that while snow runoff can increase the risk in some areas in the spring, flooding is a coast to coast threat to the United States and its territories in all months of the year. At floodsmart.gov, you can check your geographical risk via Flood Insurance Rate Maps. The National Association of Insurance Commissioners has issued a checklist on Disaster Planning for Small Businesses, which covers key steps for preparation, as well as an overview of related insurance issues that you need to consider. NAIC also issues a reminder that flood is not a covered peril in a standard business property insurance policy. They note that flood coverage can be purchased from the National Flood Insurance Program (NFIP), administered by FEMA, but there is usually a 30-day waiting period for a policy to go into force. They suggest checking with your insurance agent if the flood insurance property limits from the NFIP are inadequate to cover your business. 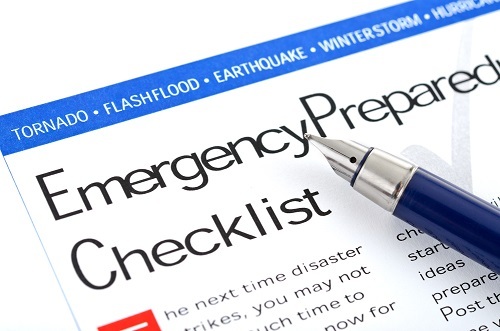 AgilityRecovery, specialists in disaster recovery, says that your business is more likely to flood than burn down, so they offer this helpful Business Flood Preparedness Checklist. The Insurance Information Institute offers a useful information on preparing for a flood and recovering from a flood. The site also offers a variety of other helpful resources related to disaster preparedness. Floodsmart.gov is the official site of the National Flood Insurance Program. You can learn about obtaining residential coverage and what it covers. The site also offers advice on flood recovery and filing claims. The eastern seaboard is thick in preparation for Hurricane Earl’s arrival. Wayne Wiersma of Wiersma Insurance Agency offers a link to an excellent one-page sheet from the folks at Harleysville Insurance: Common Sense Advice: Before & After a Hurricane. It offers planning time lines for 36 and 24 hours before a hurricane, as well as advice on what to do after a hurricane and how to report a claim. (Please note, however, that phone numbers listed are only valid if for Harleysville customers. For all others, it would be a good idea to have phone numbers handy for both your agent and your homeowners’ and auto insurance companies. ) The Insurance Information Institute also offers Hurricane Preparation Tips.